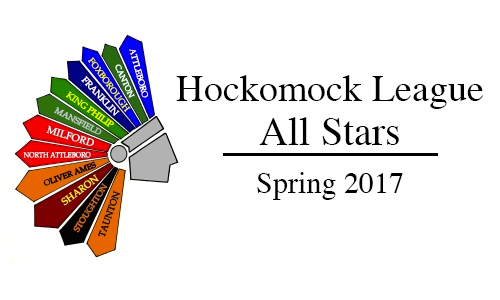 Below are the official 2017 Hockomock League Girls Outdoor Track All Stars, selected by the coaches in the league. For a history of recent Hockomock League Girls Outdoor Track All Stars, check out our history section. Attleboro, 51 vs. Franklin, 48 – Final – For the second straight week, Isaiah Rodriguez and David Seybert each won a pair of events as Attleboro edged Franklin. Rodriguez was first in the 55M dash and the long jump while Seybert won the 600M and the 1 Mile races. Brett Szlachciuk won the 1000M and Otoniel Llanos finished first in the shot put. Franklin got first place finish from Paul Kroushl (300M), freshman Dylan Pare (2 Mile) and William Jacobs (55M hurdles and high jump). Canton, 29 vs. Foxboro, 71 – Final – Foxboro had six individual wins and swept the two relay events to pick up the win. Nate Rogers (55M dash), Brendan Foley (600M), Will Pottey (55M hurdles), Jack Lovely (shot put), Matt Nutting (high jump) and Owen Whitney (long jump) all had first place finishes. Canton junior Jack Healey was first in three events, crossing first in the 1000M, the 1 Mile and the 2 Mile races. Muhammad Sambo won the 300M for the Bulldogs as well. King Philip, 29 vs. Mansfield, 71 – Final – Mansfield picked up first place finishes in eight individual races and won both relay events to get the big win over KP. For Mansfield, Nick Horn won the 300M, Mike Shannon placed first in the 600M, Sean Lanzillo took first in the 1000M, Nick Rispoli won the 1 Mile, Patrick Heavey crossed first in the 2 Mile, Colbey Eason won the shot put, Jack Olsen won the high jump and Kyle Haley took first in the long jump. King Philip’s Dylan Casassa won the 55M dash and Ethan Dunne won the 55M hurdles for the Warriors. Milford, 38 vs. North Attleboro, 62 – Final – Milford and North Attleboro each placed first in six events but the Rocketeers grabbed second in eight of those events to get the win. North’s Nick Rajotte won the 55M dash, James Elia was first in the 600M, Liam Monahan won the 2 Mile race, Brett Cloutier was first in the shot put and Mario Bresko won the high jump. Milford got wins from Christopher Cicciu (300M), Joseph Madden (1000M), Jack Kalil (1 Mile), Cameron Clark (55M hurdles) and Kevin Truong (long jump). Oliver Ames, 48 vs. Taunton, 52 – Final – Taunton swept the shot put event to help edge Oliver Ames. Khoury Simmons won the shot put (39-03.00) while John Chretien was second and Ryan Leason was third. Taunton also got wins from Jadin Bruneau (55M dash), Dylan Lynch (1 Mile), Lucas Alves (55M hurdles) and the 4×200 relay. Oliver Ames received first place finishes from Belmund Rodrigues-Pires (300M), Matt Campbell (600M), Jake Romaine (1000M), Colin Hershlag (2 Mile), Jack MacAdam (high jump), Kalil Matier (long jump) and the 4×400 relay team. Sharon, 68 vs. Stoughton, 32 – Final – Sharon won eight events to pick up the Davenport division win over Stoughton. The Eagles received wins from Christopher Gong (55M dash), Juvan Elisma (300M and long jump), freshman Isaiah Stessman (600M), Tianrui Sun (1 Mile and 2 Mile) and Matthew McManus (shot put). Stoughton’s Zach Ferreira won the 1000M, Kyle Reason won the 55M hurdles and Ritchy Laguerre won the high jump. Attleboro, 10 vs. Franklin, 90 – Final – Franklin swept both relays and took first and second in nine of the 10 individual events to get the big win. 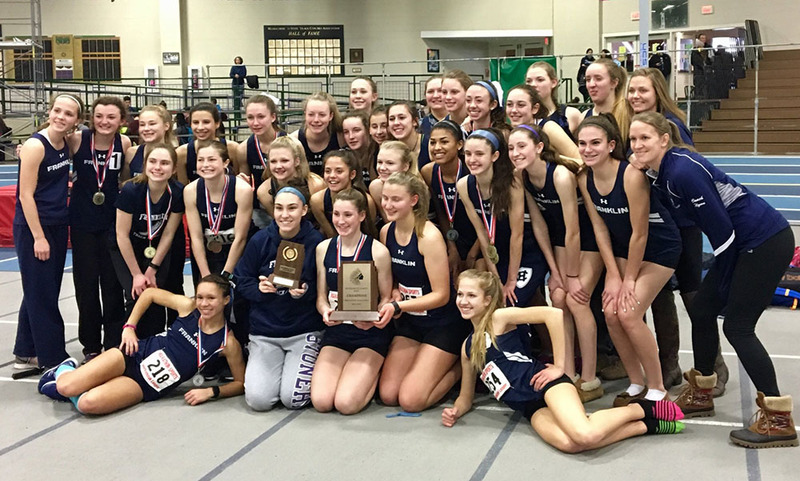 Franklin got wins from Jess Kroushl (55M dash and long jump), Meghan Doherty (300M), Nicole Clermont (600M), Katherine Hartnett (1000M), Ella Gutkowski (1 Mile), Molly Houlihan (2 Mile), Danielle Pierre (55M hurdles) and Sarah Goodermuth (shot put). Attleboro took first and second in the high jump with Victoria Pike coming in first and Allison Wall placing second. Canton, 28 vs. Foxboro, 72 – Final – Meredith Cronin and Lexi Quinn took first and second in both the 1 Mile and the 2 Mile while Angela VandenBoom won both the 300M and high jump to lead the Warriors. Other first place wins for Foxboro included Malaysia Cabral (55M hurdles), Trinity Dailey (shot put) and Shraeya Srinivasan (long jump). Canton’s Selena Cho (55M dash) and Sarah Collins (600M and 1000M) each had first place finishes. King Philip, 39 vs. Mansfield, 61 – Final – The Hornets won nine events, including both relays, to get the win over King Philip. Amanda Mangano (55M dash and high jump), Alexis Kiyanda (300M), Caitlin Whitman (600M), Lauren Duggan (1 Mile), freshman Julia Miller (2 Mile), and Angela Corkery (long jump) each placed first for Mansfield. Lucy Hamilton (1000M), Abigial Dunne (55M hurdles) and Jayla Millender (shot put) won for King Philip. Milford, 29 vs. North Attleboro, 71 – Final – The Rocketeers came in first in eight events to come away with a big win over Milford. Celine Ibrahim (55M dash), Rachel LaBonte (300M), Courtney Tong (600M), Megan Leary (1000M), Angela Kaiser (2 Mile), Juliana Martin (shot put) and Samantha Gaskin (high jump) has first place finishes for the Rocketeers. Christina Speliakos (55M hurdles and long jump) and Gabriela Chong (1 Mile) had wins for the Scarlet Hawks. Oliver Ames, 33 vs. Taunton, 67 – Final – For the second straight meet, Taunton’s Samantha Tichelaar won three events to lead the Tigers to a win. Tichelaar was first in the 55M dash, the 300M and the long jump. Freshman Tatyana Mainer-Smith won the 1 Mile, freshman Victoria Gravel won the 55M hurdles, Daelynn Fernandes was first in the shot put and Shannon Stokes won the high jump. First place finishes from Oliver Ames included Lauren Wright (600M), Dana Lowney (1000M) and freshman Anna Rice (2 Mile). Sharon, 69 vs. Stoughton, 27 – Final – The Eagles of Sharon won eight events to pick up the divisional win over Stoughton. First place wins from Sharon included Angela Wallace (55M dash), Ariadne Tolay (300M), freshman Elliana Hershman (1000M), Maria Gieg (1 Mile), Jamie Kessler (2 Mile), Maya Biran (55M hurdles), Aiyana Williams (shot put) and freshman Jada Johnson (long jump). Stoughton swept both relays and got wins from Rianna Rodrigues (high jump) and Sarina Hutchinson (600M). MILFORD, Mass. – There were plenty of obstacles that the Oliver Ames girls soccer team had to overcome throughout the regular season and playoffs, yet the Tigers put together an undefeated season. Unfortunately, Oliver Ames was unable to clear the hurdle that was Natick, the top-seeded team in the sectional. The Redhawks (19-1) scored a goal in each half to hand the Tigers their first loss of the season, 2-0, in the D1 South Semifinals. Natick had the majority of play from the get-go, Shelia McQuillen rocking the crossbar less than three minutes into the game. After some back and forth play, Natick found the back of the net for the first time in the 19th minute. Julia Adelmann created some space just outside the area and quickly hit the shot just under the crossbar for a 1-0 lead. “Natick getting that goal going against the win was huge,” Sellmayer said. “The wind definitely affected the play today but it affected both teams. We mis-marked them on that play. We were trying to figure out how to mark them and I thought we were a little cautious in the back at times. Oliver Ames created a pair of chances late in the first half. First in the 26th minute, Dana Lowney’s cross popped to Jackie Mills but her bid hit off the crossbar and stayed out. In the 35th minute, sophomore Zoe Chazan uncorked a free kick from 35 yards out but it was flashed wide. Tigers goalie Regan Benton was called upon less than two minutes into the season half. McQuillen did well to beat her defender in the corner and fired a near post shot but Benton pushed it aside and the rebound was dealt with by the defense. In the 43rd minute, the Tigers had a legitimate shout to get even in the game. Abby Reardon and Mills created some space in the area, the ball falling to the feet of the latter. 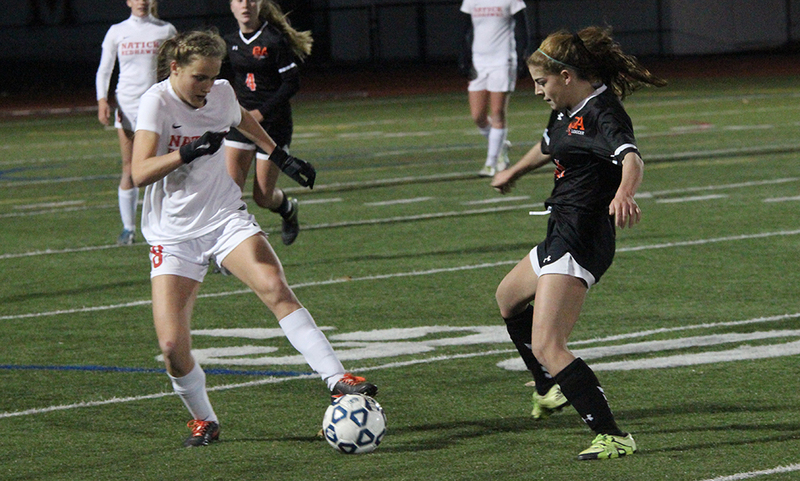 With Mills’ back towards goal, a Natick defender appeared to clear her out from behind. Instead of a penalty, the ref played on. McQuillen had another chance in the 48th minute but clanked the post. In the 62nd minute, Gwyn Godin found Adelmann wide open in front of the net but an incredible diving save from Benton kept the deficit at one. A move to midfield helped Chazan create a pair of chances for Oliver Ames just before the 70th minute mark. First, a long service on a free kick bounced into the area, popping free from Natick keeper Ashley Bianco but no one on OA could latch on before it was cleared. Two minutes later, Chazan’s switch found Lauren Wright but her one time bid towards the near post was stopped by Bianco. Just moments after OA’s chance, the Redhawks tacked on an insurance goal. Kalyn Onorato connected her cross with McQuillen for a one timer that snuck past an OA defender, giving Benton little chance at the near post. Oliver Ames girls soccer had a final chance late on a corner kick, but the ball bounced through the area and was eventually cleared, summing up the Tigers’ frustrating night. The Tigers finish at 16-1-4 with the program’s first ever Hockomock League Kelley-Rex division title and the team’s fourth straight league title.